Jeremy Miller, three-time Big 8 Series champion, advanced from his tenth starting position to claim victory in the caution-free 48 lap McGrath Family of Dealerships “Clash at the Downs” at Hawkeye Downs in Cedar Rapids Iowa Friday night. The victory is Miller’s thirteenth career Big 8 Series win, which leads the all-time series wins list. Miller grabbed the lead on the race’s 18th lap and slowly padded his lead from there over the course of the race’s final 30 laps. Griffin McGrath, a Hawkeye Downs regular, captured his third career Big 8 Series fast qualifier award and made his way through the field to finish second, which was one spot short for his liking. Another Hawkeye Downs regular rounding out the top-three was multi-time track champion Brian Gibson, who made his first start of the year in the Big 8 stop at Hawkeye Downs Friday night. The drive felt great for Gibson, who dealt with many challenges on route to his best Big 8 finish, including losing brakes early in the race, and being on a fire call all night before thanks to his responsibilities as a local fire department chief. 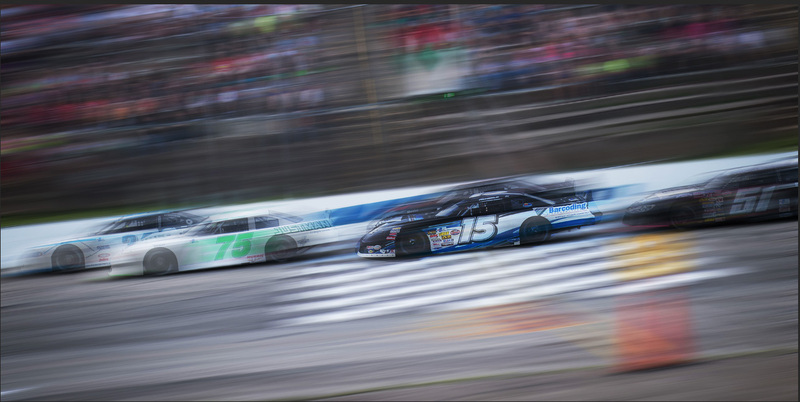 The Big 8 Late Model Series next heads to Madison International Speedway on Friday night June 29th for the annual ‘Salute to America’ event, a race in which Miller is the defending champion. The Big 8 Series will run alongside the USAC Silver Crown Champ Car Series at Madison on June 29 and the evening is scheduled to be capped off by a large Fireworks display. For a fourth consecutive year, the Big 8 Late Model Series returns to Hawkeye Downs in Cedar Rapids Iowa. But this year, for the first time ever, the ‘Best Weekly Warriors in the Country” will start their season at Hawkeye Downs. Following the weekend washout of the annual season opening Spring Classic at Rockford Speedway back in April, the 2018 Big 8 Late Model Series season will officially tip-off at the 93 year old half-mile located in Eastern Iowa. The McGrath Family of Dealerships “Clash at the Downs IV” takes place this Friday night June 1 at Hawkeye Downs and if tradition holds true, the race itself will feature a strong field of cars and a thrilling finish. An average of 27 cars have entered the three previous editions of this event with each feature coming down to some tense moments at the end of 48 laps. Hometown drivers will be among the favorites this Friday night, including Alburnett teen Brody Willett and Cedar Rapids Late Model ace Griffin McGrath. Willett, who won the Opening Night feature race at Hawkeye Downs two weeks ago, finished third in last year’s Big 8 Series points and is hungry for his first ever Series win. A late-race tangle one year ago at the “Clash” dashed any hopes Willett had of winning the big race on his hometrack and with that in mind, Willett may be a force to be reckoned with Friday night. McGrath has been fast in each of the three previous editions of the “Clash,” setting Fast Time in both 2015 and 2017 while finishing runner up in the 48 lap feature race each of the last two seasons. Last year, McGrath ended up one spot short of victory while Minnesota’s Joe Neisius captured his first ever Big 8 Series win. Neisius is not only entered in this weekends event, but plans to chase the Big 8 Series championship in 2018. Four-time Big 8 Series champion Jeremy Miller returns to Hawkeye Downs this weekend in search of a series-leading 13th career win. Miller has seen success in the past at Hawkeye Downs, but has yet to taste victory in a Big 8 Series race at at the big half mile. Minnesota’s Ryan Kamish was a solid fifth place finisher in last season’s “Clash at the Downs.” The finish helped propel Kamish to fourth place in Big 8 Series points and this year the Lakeville native returns to the Series once again. Multi-time Hawkeye Downs track champion Brian Gibson is also entered in this Friday night’s ‘Clash,’ aiming for a first Big 8 Series win. Gibson’s previous best Big 8 finish is fourth in the inaugural running of the event in 2015. Former Big 8 and Rockford Speedway champion ‘Driver X’ Jon Reynolds Jr has thrown his name into the ring for Friday night’s big-go-round in Cedar Rapids and is joined by former Madison International Speedway Rookie of the Year Matt Lundberg and reigning Big 8 Late Model Series Rookie of the Year Tyler Brown. A crop of fresh and talented faces also join the Big 8 Series fray in 2018, including Prior Lake Minnesota’s Grant Brown, Slinger Wisconsin’s Nick Egan and Cambridge Wisconsin’s Jacob Nottestad. All three drivers should be a force to be reckoned with by season’s end. Big 8 Series officials today have released the entry form for “Clash at the Downs IV” presented by the McGrath Family of Dealerships set to take place at Hawkeye Downs in Cedar Rapids Iowa on Friday June 1. The entry form may be found on the series’ website (big8series.com) under the “Entries” heading. Advance entries will be accepted until 11:59 PM on Wednesday May 30. For the first time ever, “Clash at the Downs IV'” is set to open the Big 8 Late Model Series points chase with the cancellation of April’s ‘Spring Classic’ at Rockford Speedway following unseasonably cold and winter-like conditions. Pit Gates open at 3 PM on Friday June 1, with Practice beginning at 4:30 PM. Qualifying takes place at 6 PM with racing set to begin at 7:30 PM. The Big 8 Late Model Series is set to run a full program of preliminary races and a 48 lap feature and will be joined by the full compliment of Hawkeye Downs support classes. Those looking to Practice before the event are welcomed to take part in the Wednesday night Open Practice sessions at Hawkeye Downs, which start at 5 PM and run until 7 PM. For more information on Hawkeye Downs, please visit hawkeyedowns.org or call 319-365-8656.